Air Repair Complexion Boosting Moisturizer - I chose this product for my sample choice. I don't choose every month depending on my options. However, I have tried the rescue balm and eye cream from this brand and like them both so I wanted to try something else. I've only used this moisturizer a handful of times but I really like it. It isn't too heavy or greasy. I wore it under makeup and it worked well but I think I would really love it at night. I'm not a fan of heavy night creams and I think this would moisturize without making me greasy in the morning. I have 2 samples to finish and then I'll be buying this one! A full size is $20 so a very reasonable price as well. Dr. Brandt pores no more cleanser - I have tried a lot of Dr. Brandt products over the years as well. My favorite is the microdermabrasion but there haven't been too many others I've felt the need to spend in the money on. I don't have huge pores on the majority of my face, just a few on the end of my nose and they aren't very noticeable. Therefore, I didn't notice much of a difference in my skin when I used this cleanser. It cleansed find but didn't do anything else for my skin. I won't purchase a full size. Dr. Jart+ Vital Hydra Solution Deep Hydration Sheet Mask - This product made me a little nervous because my skin is oily lately and I don't feel it needs much hydration. I haven't tried any masks from Dr. Jart+ before, mostly their BB creams. I liked that this mask was hydrating but it didn't make me oilier. A few hours later, my skin still felt nice and not like an oil slick on places like my chin and nose. That being said, I have issues with sheet masks. I don't like the slimy feeling to them with the product on them and I can't handle the feeling on my face of the mask. It makes me claustrophobic. So, this isn't something I would purchase but if you like sheet masks, I would try this one. A mask is $6 so the same price as the Sephora ones. Rusk Volumizing Mousse - I have used this a few times and I am just not a fan of mousse products. I feel like it makes my hair crunchy. I will use this product up, most likely when I want some more texture to my hair. I won't purchase a full size but it is $18. theBalm Cosmetics Balm Desert Bronzer/Blush - I love my blush from theBalm (Hot Mama) and I'm panning a palette from them right now, but I hadn't tried any of their other products. I like the shade of the bronzer but it is in such a small container, it is very hard to get my bronzer brush into the product to apply it evenly. I will keep trying and will also try to use it as an eye shadow since that brush will fit better. A full size is $21. Yet again, I was very happy with the selection I had to try out this month. 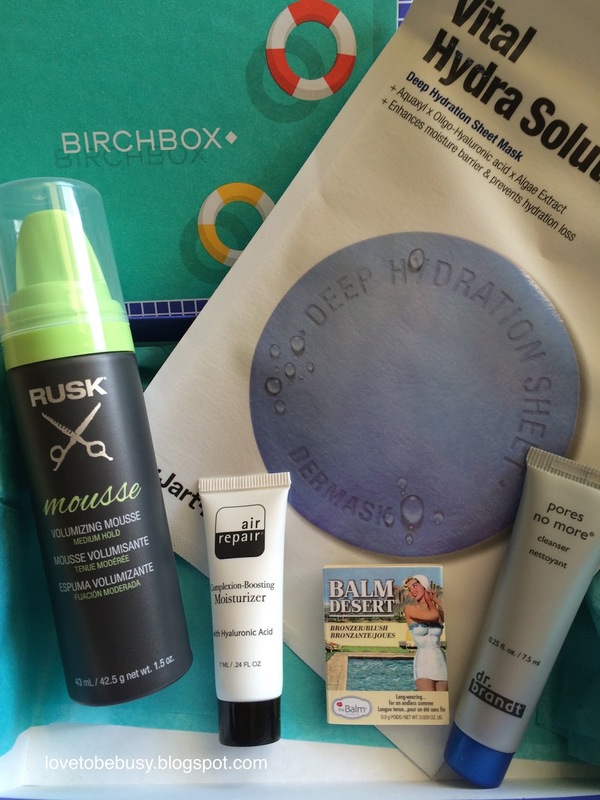 I'm a big fan of trying skincare so I love that you get a lot of that with Birchbox. What did you get this month? Yes and they tend to be slimy. I'll stick with mud or something else. Sorry, I am so behind with comment replies with school starting! I'll check out the post!